Sony owned free-to-view TV channel POP! 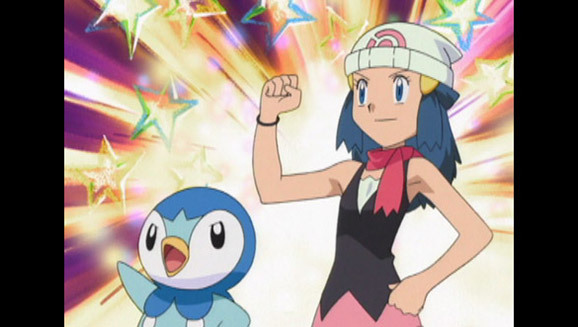 continues to expand its selection of Pokemon content by going back to the Sinnoh region as this week Pokemon: Diamond and Pearl began broadcasting on POP! in the UK with new episodes shown every weekday at 6:30pm and 7pm. POP! is available on Freeview 206, Sky 616, Freesat 603, Virgin 736, and a schedule can be found on the official website. Synopsis: If Gary Oak is headed to the Sinnoh region, Ash Ketchum won’t be far behind! Ready to take on a new challenge, Ash and Pikachu meet up with Brock in Sinnoh, where they’re joined by Dawn, a novice Pokémon Coordinator determined to follow in her mother’s footsteps. They struggle with their respective paths but it’s easy for them to make new friends, gaining Pokémon like Turtwig and Piplup. During the past few years POP!, and it’s sister channel POP! Max, have been showing Pokemon: Black & White and Pokemon: X&Y, as well as a selection of feature-length Pokemon films, in their entirety and now Pokemon: Diamond and Pearl is the latest collection to join the selection. At the moment Pokemon: Diamond & Pearl is being broadcast on POP! each weekday at 6:30pm and 7pm with reruns of these same episodes on weekends at 6:30pm and 7pm. Pokemon: Diamond and Pearl is also available to Stream on Amazon Instant Video for Amazon Prime Members. via: Thanks to Jack D on Facebook for the heads-up.